We're having trouble deciding if it is currently Winter or Spring here in Flyte so Fancy's corner of Dorset. The nights are clear and cold, with everything being covered in a frosty crystalline sheen. Then come midday the sun is shining down with such intensity, it could be considered t-shirt weather. No matter what is going on, the first signs of Spring are beginning to show and with it our thoughts for the coming year. Each year we have a use for a Broody Chicken coop for any number of uses. This versatile little house gets used in a myriad of ways, from a hospital ward, a temporary house for introducing new birds and as the name suggests, a broody coop for mother hens and chicks. The Broody Chicken Coop comes with both a house area and secure built in run, allowing your hen or chicks safe free movement. With built in handles it is easy to move around to fresh grass, and a lifting roof and removable run panel allow you complete access inside for cleaning. Sometimes if a hen has been injured badly or you are trying to sort out a particularly bad bullying problem, isolating a hen in the broody coop can help it recuperate and get back to full strength before returning it to the flock. Equally if you are segregating a bird to stop them from bullying others, the broody coop allows the bird to separate, giving the rest relief, while still allowing the birds to see and interact with each other. When introducing new birds to an established flock it is best to give the new bird a safe space for them to be in, until the flock accepts them. The secure wiremesh run allows the birds to see each other, and quickly allows for a new bird to be accepted by a flock making the whole process of introducing news birds quick and easy, without having to worry about bullying. Here at FSF HQ we regularly have new hens come to live us in the poultry paddock and we always use a broody coop as a preliminary way of introducing them. As the name suggests the main use for the Broody Chicken Coop is as a broody hen house, for naturally incubating eggs under a broody hen or as a safe home for growing chicks, until they are ready for something a little bigger. We have a Buff Orpington that goes broody every single year and so each spring we always have chicks. All of our chicks grow up in the broody coop, where they are safe, until they are large enough to move to a bigger house, before finally being released into the poultry paddock. 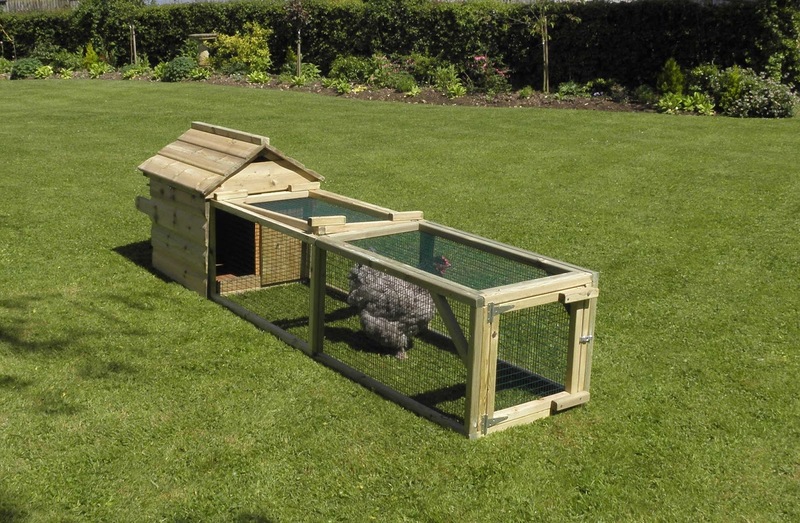 The broody coop comes with the option of a longer two metre run, giving your chicks even more space to stretch their mini wings. The Broody Chicken Coop is an essential hen house for chicken keepers. With its many uses, compact design and easy portability it is ideally designed for any number of problems poultry keepers can face. If you have questions about the broody chicken coop, leave a comment below or call us on 01300 345229 to speak to a member of the FSF team. If you have been reading this Blog for a while now, you will know of my great affection for the ducks that live on and around the pond, down in the poultry paddock. The Cayuga's that we hatched from chicks, our old fat Saxony drake that waddles around and the wild ducks that live on the pond, are all among my favourites. Our ducks tend to sleep where they want. Some enjoy joining the chickens inside their hen houses, while others will head out to the floating Duck Lodge for an evenings kip. During high summer, they have been known to just settle down on the edge of the pond. Here at Flyte so Fancy we manufacture lots of different duck and goose houses, ideal for any garden, but in this blog I thought I would focus on three different duck houses designed for three very different situations. Offered in two different sizes, these compact duck houses are perfect for those looking to house a pair of ducks (or a small flock of four in the larger size) in their back garden. Ideal for breeds like Call Ducks, Mallards in the small size, and a pair of Aylesburys or Indian Runners in the larger, the Puddleduck Duck House allows anyone to keep a few "quackers" in the garden. It has ventilation holes in the back of the house and a side opening roof for easy access and cleaning, helping keep the house hygienic for your ducks. The ramp entry also acts as a secure door, with a secure bolt closing, with the house having a good sized doorway for ducks to fit through. The Puddleduck Duck House is the perfect little home for those looking to keep a couple of ducks in their back garden. Ducks like to be clean, and enjoy preening their feathers as much as the next bird, unfortunately the ground around their house doesn't always get the same attention and the addition of duck plus ground and add water soon equals mud. The Stroller Duck House has been designed as a movable coop, lifted like a wheelbarrow on its built in wheels and then wheeled to fresh pasture, whenever the ground gets too muddy. Well ventilated and with a removable roof panel for both egg collecting and cleaning, the duck stroller is a happy home for up to six ducks. It's large access door means no one will have to take their hat off upon walking through the door way. The Stroller Duck House is designed for those of you that have a large paddock or garden and are looking for a movable house to avoid you and your web-footed friends wading through half a foot of mud. Designed for those of us lucky enough to have a big pond, the Floating Duck Lodge is a floating island home for your ducks, with room for up to six pairs of nesting ducks. The timber float is packed with polystyrene and floats perfectly to allow your ducks easy stepping in and out of the water. It also provides a large veranda for them to while away the days, sitting in the sunshine and quacking, by their waterside apartment. The house itself comes with a removable roof, allowing for top-down access into the house when it comes to cleaning. Six individual nest ares, provide space for up to six pairs of nesting ducks, Our Cayuga crosses sleep in the floating Duck Lodge almost exclusively, they love it. There is even one of these floating in London Dockyards by the Hilton Hotel. These different duck houses are just a selection of the duck and goose housing we make here at Flyte so Fancy, from the small to the very large. If you have any questions about our duck and goose housing leave a comment below; or phone 01300 345229 to talk to a member of the FSF team. Over the last few months one of our regular customers to the Flyte so Fancy Shop has been having terrible trouble with feather pecking in her flock of seven hens. Here at FSF HQ we suggested the whole gamut of solutions. Anti-feather pecking sprays, poultry saddles, extra treats to divert the chickens attention away from pecking. Unfortunately nothing worked, until the customer mentioned that she had them in a coop purchased elsewhere that claimed to hold up to ten birds, but in reality the space was no where near enough for the seven ladies she had inside it. The suggestion of a new coop giving them more room inside the house and also in the run for them to stretch their wings, has hopefully solved the issue and in the coming months we hope to see positive results. Convention has always said that you should allow 1 sq ft of floor area per bird inside the house, for them to have enough room to be happy and healthy. Equally there should be around 7-8 inches of perch space per bird. giving them room to roost comfortably. You will also want to make sure that the perches are around 8 inches apart. Over-crowding can be a real issue leading to health issues, the hen house over-heating with all your birds crammed inside and also bullying behaviour as hens jostle for room. Putting too many hens in a confined space can also potentially lead to suffocation, as hens over heat in the small space. Conversely, if you put too few hens in a large space that they cannot heat, they can freeze. It is important to get the right balance by getting a coop that suits the number of hens you have (with wiggle room for expanding your flock) and has plenty of space inside for each bird to roost and live happily. 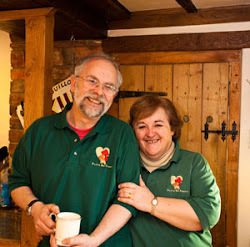 All Flyte so Fancy hen house are built to these guidelines to promote happy and healthy living for hens. We also make sure that the nestboxes and perches are set up in the best way for the birds. The nestbox should be low down and in the darkest part of the hen house to provide privacy and to allow your girls to lay their eggs undisturbed. The perches should always be raised up and higher than the nestbox. Hens always look for the highest point to roost and if the nestbox is higher than the perches, that is where the hens will sleep. This will make them dirty, which is not desirable. These simple considerations when choosing your chicken coop can avoid all manner of issues with poultry keeping, leading to successful happy hens. If you have any questions or need help choosing the best hen house, why not leave a comment below, or call us on 01300 345229 to speak to a member of the Flyte so Fancy team.